Joanna doesn't know what to do with herself. With her two younger sisters married and settled in their own homes, Joanna Hamilton is not sure if she wants to run the stopping house in Bonners Ferry, Idaho, on her own. All she needs to do is find a buyer so she can start a new life. Rudy Canfield travels from place to place as a cowboy. And that suits him just fine. Footloose and fancy-free. Until he takes in his orphaned, ten-year-old nephew, Freddy. And the lovely owner of the stopping house keeps meddling in his business. As Joanna and Rudy help Freddy learn to trust, they discover that the little boy's feelings of abandonment strike too close to home. Rudy has known only rejection from the women in his life. And Joanna would be foolish to risk her heart on a cowboy wanderer who reminds her so much of her absentee father. Can two wounded people learn to trust each other and stop running from love? 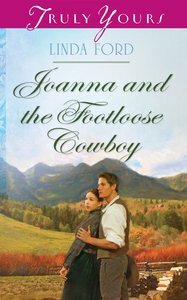 About "Joanna and the Footloose Cowboy (Heartsong Series)"